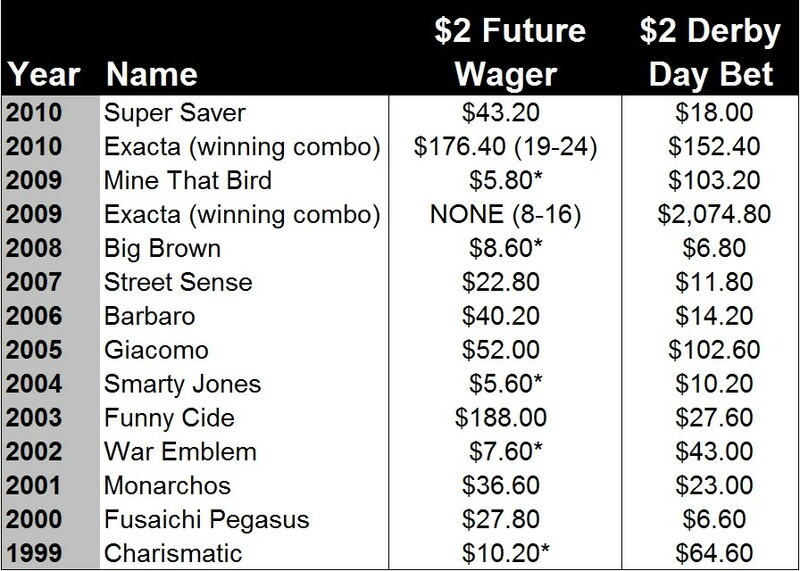 This weekend marks the debut of the first Kentucky Derby Future Wager (Pool 1). 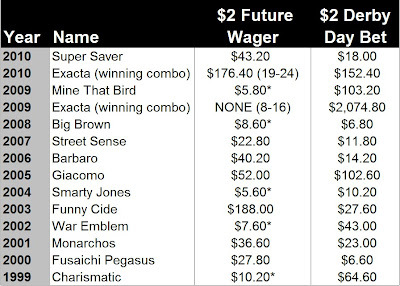 The pari-mutuel bet, which has been offered since 1999, runs from Feb. 18-20 and provides punters with the opportunity to lock in some very attractive prices on potential Derby starters. 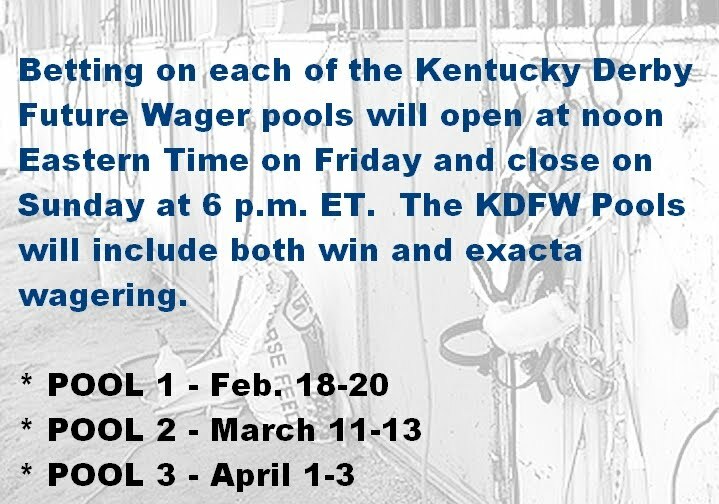 The pool consists of 24 wagering interests — 23 individual steeds and the mutuel field, which is comprised of all the remaining three-year-olds in training. In the past 12 years, five “field” horses from Pool 1 have gone on to wear the roses, good for a 57.5 percent return on investment (ROI). *Member of the mutuel field. Comments: There are several things to like about this guy, starting with his ability to gain ground on the turn, which he demonstrated in his lifetime bow at Remington Park and, again, on Jan. 15 at Oaklawn Park. Comments: Son of A.P. Indy earned a -12 early speed ration (ESR) in his first Kentucky route and then, reminiscent of Super Saver, he improved greatly in his second tour of Churchill Downs on Oct. 31, when he rated off a slow pace and garnered a -1 LSR. Trainer Todd Pletcher broke his losing skein last year, is it Steve Asmussen’s turn this year? Comments: Right now, he’s not as good as some of the other contenders but Beamer appears to be headed in the right direction and could be at his peak come the first Saturday in May. Comments: Sure, the Beyer Boys seem to think he’s a little slow, but the way Super Saver’s little brother won in Florida convinced me that he’s a talent to be reckoned with. Comments: Yeah, I know, the Peter Miller trainee has already accumulated 11 lifetime starts — the last Derby winner to have raced more prior to the first Saturday in May was Charismatic in 1999 — and, true, “Comma” didn’t exactly look like a champion in his sophomore debut, but there’s light at the end of the tunnel. The son of Bwana Charlie (true, that’s another negative) clearly needed his last race and he has a nice blend of early and late speed. Plus, some of his efforts as a two-year-old were simply spectacular. Comments: In my mind, this lightly-raced colt still has a ton to prove — remember, winning the Kentucky Derby isn’t necessarily about talent — but, at the very least, one can be relatively confident that Dialed In will be in the starting gate at Churchill Downs on May 7 (barring injury). Still, I think this guy is very likely to be an underlay in this weekend’s pool. Comments: He deserves respect if only for his consistency. Comments: Very similar to Gourmet Dinner in some respects; his solid effort in the CashCall Futurity buys him a little more time on the contender’s list. Comments: Son of Smoke Glacken has some distance questions to answer and he needs to prove he can come off the pace, but he’s got some things to like — most notably a Hall of Fame trainer (Jerry Hollendorfer). Comments: Jaycito’s Norfolk win was very impressive, making him a fringe contender for the Run for the Roses. Comments: He’s been the easiest of winners in each of his two career starts, but he’s very light on seasoning and is almost sure to be a pool underlay if he captures the Risen Star as expected. Comments: Out of 1995 Kentucky Derby winner Thunder Gulch, Monzon looked great capturing the Count Fleet and then, not surprisingly, regressed in the Sam F. Davis. He hinted at ability as a juvenile and will be interesting to watch going forward. Comments: If this horse can learn to come off the pace — a big “if,” to be sure — he could be a factor at Churchill Downs. Comments: Given that Pluck is owned by Team Valor, an aggressive ownership group, I would think that he’ll at least be given a shot on the main track at some point. Comments: His breeding is terrible for a horse seeking to go 10 furlongs — assuming that the son of Pomeroy is, in fact, bluegrass bound. That said, the sophomore gelding has talent and deserves some consideration. Comments: NY-bred has steadily progressed since breaking his maiden in an off-the-turf affair at Aqueduct on Nov. 6. Comments: My “sleeper” pick among all of this year’s potential Derby contenders, Sherriff Cogburn has yet to be challenged in two lifetime starts and he has earned some excellent pace figures as well. The question is, where is he… and is he even on the Derby trail? Comments: I can’t say he looks like a potential Derby winner at this point, but he does look like the type that could easily hit the board; needs to demonstrate he can handle dirt. Comments: Kiaran McLaughlin protégé is very talented, as witnessed by his stellar performances on both dirt and grass. He’s also got tactical speed and a fantastic late kick. What’s more the 108 Brisnet speed figure he earned in his last start — a romping allowance tally — exceeds the Derby par… and it’s only February. Comments: His only poor performance came in the Delta Downs Jackpot over a bullring that many horses have difficulty adjusting to. Sweet Ducky showed ability as a two-year-old and has every right to move forward at age three. Comments: Had trouble in his stakes debut when fourth behind Sweet Ducky in the Garden State Stakes and then blew away a decent field in the Display at Woodbine. Son of Tiznow is the kind of horse that could get lost in the shuffle, but he’s one that sharp players will definitely want to keep on the radar screen. Comments: From the standpoint of talent, connections and conditioning as a two-year-old, this guy looks like a prime Kentucky contender, but his performance in the Remsen gives me pause. 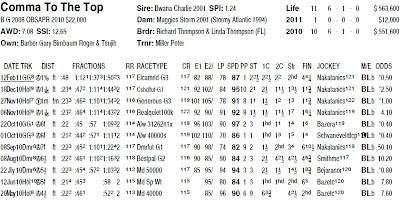 That race was To Honor And Serve’s first around two turns and produced an LSR of –10 — not bad, but somewhat low when compared to some of his main could-be Derby rivals. Whether or not the Bill Mott trainee learns to come off the pace will ultimately decide his fate, I believe. Comments: Another very talented “other” horse that merits a long look. His maiden breaker at Laurel on Nov. 25 was one for the ages and his Brisnet speed figures continue to show steady upward progress. Comments: I’ve noted before that Uncle Mo’s debut was among the best I’ve ever seen. Actually, it was among the best I’ve never seen, as “Mo” recorded a 110 Brisnet speed rating (the Kentucky Derby par is 107) and a -3 LSR — the latter of which was better than the debut number of Affirmed, Seattle Slew, Spectacular Bid and, yes, even Secretariat. And nothing the son of Indian Charlie has done since then makes me think he is anything less than a potential superstar. That said, as we saw last year with Eskendereya (another horse I was very high on), a lot can happen on the Triple Crown trail — most of them not good. Still, this guy is clearly the one to beat on the first Saturday in May. Comments: This guy improved a ton over the course of his three starts last year, but needs to prove he can transfer that form to dirt. Honorable Mention: Dancinginherdreams will likely go in the Kentucky Oaks but, make no mistake, she’s a runner and would be a factor if she chooses to tackle the boys. Great work on this post. You seem to have left out MY horse though. Rogue Romance :). I hate that he is running this weekend. My price will get killed after he jogs past them in the stretch. I'm intrigued by Sweet Ducky. He has done nothing wrong and could improve. 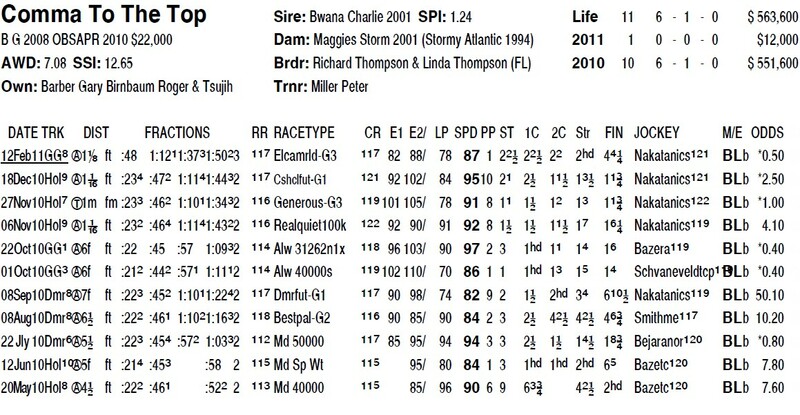 I'm no fan of Pulpit as a sire though. Jaycito also seems interesting. The future of education is here now. You can discover more just read this page!